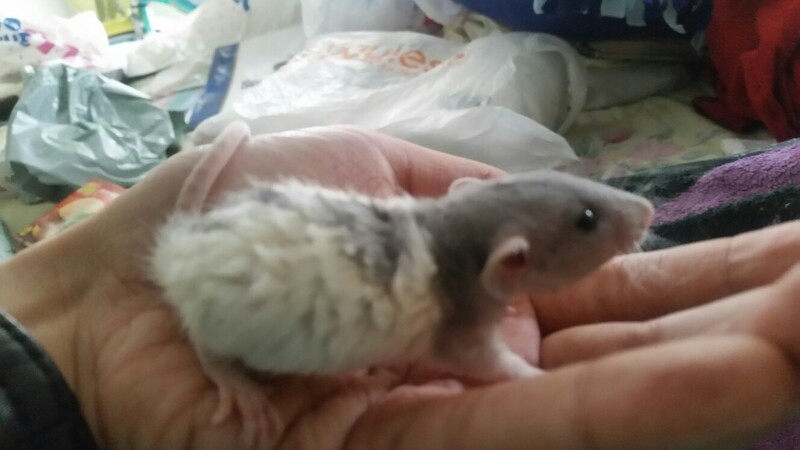 I took in a young feeder rat from a reptile shop I frequent and I would like to determine his age, as to whether he's weaned yet or not. I have formula already just in case, and gave him some electrolyte baby drink as he was in a rack system without food and water for who knows how long. No, they had no mother with them. I was smitten with him when I spotted him as I was getting hornworms for my other animals; I never thought I'd see a rex dumbo as a feeder, or the hairless and patchworks that were also with him. I tried to resist, but my brain was like, "A third rat is totally doable ". He's actually incredibly sweet and fearless. He lets me pick him up and hold him, licks me, and have eaten softened Mazuri rat food; he seems to have difficulty biting into hard blocks. He's currently sleeping in a bonding bag on my lap, cuddled to my hand. I also want to know his age so I know when it's safe to introduce him to my two adult males after quarantine. Awww, he's adorable! But I'm not a good guesser for his age. Hard to tell, at least 4 weeks because eyes are fully opened and such, but hasn't molted baby coat yet so tops 5 weeks? If he will eat softened lab blocks that is a good start. You can also try scrambled eggs, jarred human baby food, cooked veggies, etc and as he gets used to eating slowing add larger chunks to his food moving towards solids. Ensure mixed with human baby cereal is a also an easy mix up to give him. I'm guessing five or six weeks in that photo.